Last week, the Washington Metropolitan Area Transit Authority, or WMATA, made the unexpected decision to suspend its Metrorail subway service for 29 hours to do emergency inspections after an electrical cable caught fire. The announcement came as a surprise Tuesday afternoon, causing frustration as more than 700,000 weekday riders had to look for other options to get to work or school or complete errands the next day. WMATA’s decision to prioritize safety above all else should be respected. Without a doubt, the shutdown was inconvenient, disruptive, and costly. Still, Metrorail has proven to be a worthy investment for the region and significantly better than any transportation alternative. Some riders were still able to complete their trips with Metrobus service. Others walked, biked, used ride-hailing services such as Uber or Lyft, or drove. The shutdown affected both Metrorail riders and other users of the wider transportation system. More cars on highways and arterial roads meant more congestion and slower commutes for everyone. The normally crowded rush hour buses became uncomfortably jam-packed. Mercifully, the federal government and many other employers allowed their D.C.-area workers to telework or take unscheduled leave, which alleviated some of the congestion. Many workers do not have such flexibility in their transportation options or their work schedules. It is critical to remember that a significant portion of riders use Metrorail out of necessity. Life doesn’t stop even when Metrorail does. Of the takeaways from this maddening experience, one in particular stands out: This never needed to happen. A weekday shutdown makes the news, but every Metrorail rider has suffered through different symptoms—delays, single trackings, weekend closures, and train offloadings—of the same problem. Consistent underfunding and unaddressed maintenance has led to an underperforming transit system. WMATA needs $1 billion annually to keep current service levels. Meeting the growing demands on the system means catching up on past deferred maintenance at an additional cost of $6 billion over a 10-year period. Poor management by top executives has long plagued WMATA. Meanwhile, the District of Columbia, the state of Maryland, the commonwealth of Virginia, local cities and counties, the federal government, and Congress each have a role in the governance, oversight, and funding of WMATA. With so many jurisdictions responsible for the agency, maintaining accountability is challenging. Despite having the second-largest rail system in the country, WMATA is the only major U.S. transit system that lacks taxing authority. Consequently, the agency depends on appropriated subsidies from the federal government and member jurisdictions instead of a dedicated portion of sales or property taxes—leading to recurring budgeting issues. Policymakers and taxpayers need to recognize the benefits of the transit system. A nearby Metrorail station increases property values by catalyzing job growth and private investment. It helps tourists easily navigate the region. Federal employees make up more than one-third of total ridership. If regional transit simply disappeared, governments throughout the D.C. region would need to build an additional 1,000 lane miles in both highways and arterial roads just to keep traffic moving at current speeds, not to mention enough parking spots to fill a five-level garage covering a swath of downtown from Constitution Avenue up to Dupont and Logan Circles. There are significant challenges ahead in restoring both Metrorail’s service and the public’s trust, but suggestions that the system has outserved its usefulness are ludicrous. Metrorail is a regional investment with enormous and ongoing economic, social, and mobility benefits for riders and nonriders alike. 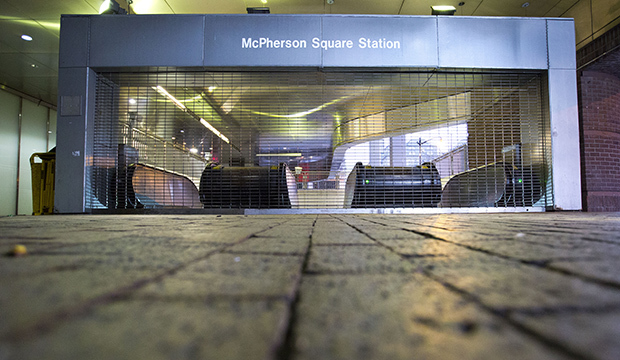 Former President Lyndon B. Johnson envisioned Metrorail to serve as “an opportunity to make our Capital a more attractive and inspiring place in which to live and work.” The March 16 shutdown implores us not to let that opportunity go to waste. * Note: 570,274 riders (total Metrorail weekday ridership minus about 20 percent of trips that are not taken in the absence of transit service) losing 8.6 minutes each (mean travel time to work in the D.C. area is 34.3 minutes, and predicted peak travel times increase 25 percent without any transit—time estimates without Metrorail but including other types of transit were not available) results in 76,036 total hours lost. The calculation excludes any delays from congestion due to additional vehicles. In comparison, a WMATA study using a regional travel demand model found that the entire transit system has daily time savings of 148,000 hours for people in the D.C. region relative to no transit. This estimation of commuting time value treats all trips as personal, even those in which the rider is commuting to or from work. An adjusted rate of 50 percent of average hourly wages is the suggested method to calculate the time value of leisure travel. Calculations use Bureau of Labor Statistics May 2014 Washington-Arlington-Alexandria, D.C.-VA-MD-WV metropolitan statistical area mean hourly wage estimates as a marginal cost of labor.